Sciurus carolinensis is native to the eastern and midwestern United States, and to the southerly portions of the eastern provinces of Canada. The native range of the eastern gray squirrel overlaps with that of the fox squirrel (Sciurus niger), with which it is sometimes confused, although the core of the fox squirrel's range is slightly more to the west. The eastern gray squirrel is found from New Brunswick to Manitoba, south to East Texas and Florida. Breeding eastern gray squirrels are found in Nova Scotia, but whether this population was introduced or came from natural range expansion is not known. It has also been introduced into Ireland, Britain, Italy, South Africa, and Australia (where it was extirpated by 1973). Eastern gray squirrels in Europe are a concern because they have displaced some of the native squirrels there. In 1966, this squirrel was also introduced to Vancouver Island in Western Canada in the area of Metchosin, and has spread widely from there. They are considered highly invasive and a threat to both the local ecosystem and the native red squirrel. A prolific and adaptable species, the eastern gray squirrel has also been introduced to, and thrives in, several regions of the western United States. 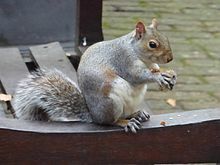 The gray squirrel is an invasive species in Britain; it has spread across the country and has largely displaced the native red squirrel, S. vulgaris. In Ireland, the red squirrel has been displaced in several eastern counties, though it still remains common in the south and west of the country. That such a displacement might happen in Italy is of concern, as gray squirrels might spread to other parts of mainland Europe. The generic name, Sciurus, is derived from two Greek words, skia, meaning shadow, and oura, meaning tail. This name alludes to the squirrel sitting in the shadow of its tail. The specific epithet, carolinensis, refers to the Carolinas, where the species was first recorded and where the animal is still extremely common. In the United Kingdom and Canada, it is simply referred to as the "grey squirrel". In the US, "eastern" is used to differentiate the species from the western gray squirrel (Sciurus griseus). Close-up of an eastern gray squirrel's head; note the brownish fur on its face, the gray fur on its back and the white fur on its underside. The head and body length is from 23 to 30 cm (9.1 to 11.8 in), the tail from 19 to 25 cm (7.5 to 9.8 in), and the adult weight varies between 400 and 600 g (14 and 21 oz). They do not display sexual dimorphism, meaning there is no gender difference in size or coloration. The dental formula of the eastern gray squirrel is 1023/1013 (Upper teeth/Lower Teeth). 1.0.2.31.0.1.3 × 2 = 22 total teeth. Incisors exhibit indeterminate growth, meaning they grow consistently throughout life, and their cheek teeth exhibit brachydont (low-crowned teeth) and bunodont (having tubercles on crowns) structures. Like many members of the family Sciuridae, the eastern gray squirrel is a scatter-hoarder; it hoards food in numerous small caches for later recovery. Some caches are quite temporary, especially those made near the site of a sudden abundance of food which can be retrieved within hours or days for reburial in a more secure site. Others are more permanent and are not retrieved until months later. Each squirrel is estimated to make several thousand caches each season. The squirrels have very accurate spatial memory for the locations of these caches, and use distant and nearby landmarks to retrieve them. Smell is used partly to uncover food caches, and also to find food in other squirrels' caches. Scent can be unreliable when the ground is too dry or covered in snow. Squirrels sometimes use deceptive behavior to prevent other animals from retrieving cached food. They will pretend to bury the object if they feel that they are being watched. They do this by preparing the spot as usual, for instance, digging a hole or widening a crack, miming the placement of the food, while actually concealing it in their mouths, and then covering up the "cache" as if they had deposited the object. They also hide behind vegetation while burying food or hide it high up in trees (if their rival is not arboreal). Such a complex repertoire suggests that the behaviors are not innate, and imply theory of mind thinking. The eastern gray squirrel is one of very few mammalian species that can descend a tree head-first. It does this by turning its feet so the claws of its hind paws are backward-pointing and can grip the tree bark. Eastern gray squirrels build a type of nest, known as a drey, in the forks of trees, consisting mainly of dry leaves and twigs. The dreys are roughly spherical, about 30~60 cm in diameter and are usually insulated with moss, thistledown, dried grass, and feathers to reduce heat loss. Males and females may share the same nest for short times during the breeding season, and during cold winter spells. Squirrels may share a drey to stay warm. They may also nest in the attic or exterior walls of a house, where they may be regarded as pests, as well as fire hazards due to their habit of gnawing on electrical cables. In addition, squirrels may inhabit a permanent tree den hollowed out in the trunk or a large branch of a tree. Eastern gray squirrels are crepuscular, or more active during the early and late hours of the day, and tend to avoid the heat in the middle of a summer day. They do not hibernate. Predators include humans, hawks, weasels, raccoons, foxes, domestic and feral cats, snakes, owls, and dogs. In its introduced range in South Africa, it has been preyed on by African harrier-hawks. Eastern gray squirrels are born hairless with their eyes closed. Eastern gray squirrels can breed twice a year, but younger and less experienced mothers normally have a single litter per year in the spring. Depending on forage availability, older and more experienced females may breed again in summer. In a year of abundant food, 36% of females bear two litters, but none will do so in a year of poor food. Their breeding seasons are December to February and May to June, though this is slightly delayed in more northern latitudes. The first litter is born in February or March, the second in June or July, though, again, bearing may be advanced or delayed by a few weeks depending on climate, temperature, and forage availability. In any given breeding season, an average of 61 – 66% of females bear young. If a female fails to conceive or loses her young to unusually cold weather or predation, she re-enters estrus and has a later litter. Five days before a female enters estrus, she may attract up to 34 males from up to 500 meters away. Eastern gray squirrels exhibit a form of polygyny, in which the competing males will form a hierarchy of dominance, and the female will mate with multiple males depending on the hierarchy established. Normally, one to four young are born in each litter, but the largest possible litter size is eight. The gestation period is about 44 days. The young are weaned around 10 weeks, though some may wean up to six weeks later in the wild. They begin to leave the nest after 12 weeks, with autumn born young often wintering with their mother. Only one in four squirrel kits survives to one year of age, with mortality around 55% for the following year. Mortality rates then decrease to around 30% for following years until they increase sharply at eight years of age. Rarely, eastern gray females can enter estrus as early as five and a half months old, but females are not normally fertile until at least one year of age. Their mean age of first estrus is 1.25 years. The presence of a fertile male will induce ovulation in a female going through estrus. Male eastern grays are sexually mature between one and two years of age. Reproductive longevity for females appears to be over 8 years, with 12.5 years documented in North Carolina. These squirrels can live to be 20 years old in captivity, but in the wild live much shorter lives due to predation and the challenges of their habitat. At birth, their life expectancy is 1–2 years, an adult typically can live to be six, with exceptional individuals making it to 12 years. 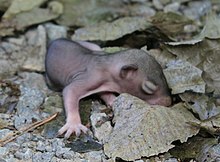 Newborn gray squirrels weigh 13-18 grams and are entirely hairless and pink, although vibrissae are present at birth. 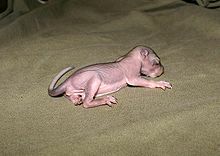 7–10 days postpartum, the skin begins to darken, just before the juvenile pelage grows in. Lower incisors erupt 19–21 days postpartum, while upper incisors erupt after 4 weeks. Cheek teeth erupt during week 6. Eyes open after 21–42 days, and ears open 3–4 weeks postpartum. Weaning is initiated around 7 weeks postpartum, and is usually finished by week 10, followed by the loss of the juvenile pelage. Full adult body mass is achieved by 8–9 months after birth. As in most other mammals, communication among eastern gray squirrel individuals involves both vocalizations and posturing. The species has a quite varied repertoire of vocalizations, including a squeak similar to that of a mouse, a low-pitched noise, a chatter, and a raspy "mehr mehr mehr". Other methods of communication include tail-flicking and other gestures, including facial expressions. Tail flicking and the "kuk" or "quaa" call are used to ward off and warn other squirrels about predators, as well as to announce when a predator is leaving the area. Squirrels also make an affectionate coo-purring sound that biologists call the "muk-muk" sound. This is used as a contact sound between a mother and her kits and in adulthood, by the male when he courts the female during mating season. The use of vocal and visual communication has been shown to vary by location, based on elements such as noise pollution and the amount of open space. For instance, populations living in large cities generally rely more on the visual signals, due to the generally louder environment with more areas without much visual restriction. However, in heavily wooded areas, vocal signals are used more often due to the relatively lower noise levels and a dense canopy restricting visual range. 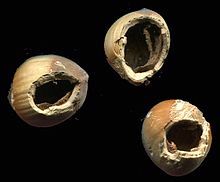 Eastern gray squirrels eat a range of foods, such as tree bark, tree buds, berries, many types of seeds and acorns, walnuts, and other nuts, like hazelnuts (see picture) and some types of fungi found in the forests, including fly agaric mushrooms (Amanita muscaria). They can cause damage to trees by tearing the bark and eating the soft cambial tissue underneath. In Europe, sycamore (Acer pseudoplatanus L.) and beech (Fagus sylvatica L.) suffer the greatest damage. The squirrels also raid gardens for tomatoes, corn, strawberries, and other garden crops. Sometimes they eat the tomato seeds and discard the rest. On occasion, eastern gray squirrels also prey upon insects, frogs, small rodents including other squirrels, and small birds, their eggs, and young. They also gnaw on bones, antlers, and turtle shells – likely as a source of minerals scarce in their normal diet. Gray squirrel enjoying a small snack on rural deck in New Hampshire, USA. It has been very cold for months: note thick coat and layer of fat. Eastern gray squirrels have a high enough tolerance for humans to inhabit residential neighborhoods and raid bird feeders for millet, corn, and sunflower seeds. Some people who feed and watch birds for entertainment also intentionally feed seeds and nuts to the squirrels for the same reason. However, in the UK eastern gray squirrels can take a significant proportion of supplementary food from feeders, preventing access and reducing use by wild birds. Attraction to supplementary feeders can increase local bird nest predation, as eastern gray squirrels are more likely to forage near feeders, resulting in increased likelihood of finding nests, eggs and nestlings of small passerines. The eastern gray squirrel is an introduced species in a variety of locations in western North America: in western Canada, to the southwest corner of British Columbia and to the city of Calgary, Alberta; in the United States, to the states of Washington and Oregon and, in California, to the city of San Francisco and the San Francisco Peninsula area in San Mateo and Santa Clara Counties, south of the city. It has become the most common squirrel in many urban and suburban habitats in western North America, from north of central California to southwest British Columbia. At the turn of the 20th century, the eastern gray squirrel was introduced into South Africa, Ireland, Hawaii, Bermuda, Madeira Island, the Azores, the Canary Islands, Cape Verde, Italy and the United Kingdom. In South Africa, though exotic, it is not usually considered an invasive species owing to its small range (only found in the extreme southwestern part of the Western Cape, going north as far as the small farming town of Franschhoek), as well because it inhabits urban areas and places greatly affected by humans, such as agricultural areas and exotic pine plantations. Here, it mostly eats acorns and pine seeds, although it will take indigenous and commercial fruit, as well. Even so, it is unable to use the natural vegetation (fynbos) found in the area, a factor which has helped to limit its spread. It does not come into contact with native squirrels due to geographic isolation (a native tree squirrel, Paraxerus cepapi, is found only in the savanna regions in the northeast of the country) and different habitats. Gray squirrels were first introduced to Britain in the 1870s, as fashionable additions to estates. They spread rapidly across England, and then became established in both Wales and parts of southern Scotland. On mainland Britain, they have almost entirely displaced native red squirrels. Larger than red squirrels and capable of storing up to four times more fat, gray squirrels are better able to survive winter conditions. They produce more young and can live at higher densities. Gray squirrels also carry the squirrelpox virus, to which red squirrels have no immunity. When an infected gray squirrel introduces squirrelpox to a red squirrel population, its decline is 17-25 times greater than through competition alone. In Ireland, the displacement of red squirrels has not been as rapid because only a single introduction occurred, in County Longford. Schemes have been introduced to control the population of gray squirrels in Ireland to encourage the native red squirrels. Eastern gray squirrels have also been introduced to Italy, and the European Union has expressed concern that they will similarly displace the red squirrel from parts of the European continent. In Britain and Ireland, the eastern gray squirrel is not regulated by natural predators, other than the European pine marten, which is generally absent from England and Wales. This has aided its rapid population growth and has led to the species being classed as a pest. Measures are being devised to reduce its numbers, including one plan for celebrity television chefs to promote the idea of eating the squirrels. In areas where relict populations of red squirrels survive, such as the islands of Anglesey and Brownsea, programs exist to eradicate gray squirrels in an effort to allow red squirrel populations to recover. Although complex and controversial, the main factor in the eastern gray squirrel's displacement of the red squirrel is thought to be its greater fitness, hence a competitive advantage over the red squirrel on all measures. The eastern gray squirrel tends to be larger and stronger than the red squirrel and has been shown to have a greater ability to store fat for winter. The squirrel can, therefore, compete more effectively for a larger share of the available food, resulting in relatively lower survival and breeding rates among the red squirrel. Parapoxvirus may also be a strongly contributing factor; red squirrels have long been fatally affected by the disease, while the eastern gray squirrels are unaffected, but thought to be carriers – although how the virus is transmitted has yet to be determined. However, several cases of red squirrels surviving have been reported, as they have developed an immunity – although their population is still being massively affected. The red squirrel is also less tolerant of habitat destruction and fragmentation, which has led to its population decline, while the more adaptable eastern gray squirrel has taken advantage and expanded. 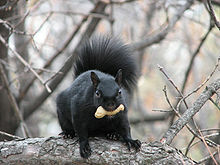 Ironically, "fears" for the future of the eastern gray squirrel arose in 2008, as the melanistic form (black) began to spread through the southern British population. In the UK, if a "grey squirrel" (eastern gray squirrel) is trapped, under the Wildlife and Countryside Act 1981, it is illegal to release it or to allow it to escape into the wild; instead, it should be humanely destroyed. 20 different Pleistocene fauna specimens contain S. carolinensis, found in Florida and dated to be as early as the late Irvingtonian period. Body size seems to have increased during the early to middle Holocene and then decreased to the present size seen today. Gray squirrels were eaten in earlier times by Native Americans and their meat is still popular with hunters across most of their range in North America. Today, it is still available for human consumption and is occasionally sold in the United Kingdom. However, physicians in the United States have warned that squirrel brains should not be eaten, because of the risk that they may carry Creutzfeldt–Jakob disease. ^ Thorington, R.W. Jr.; Hoffmann, R.S. (2005). "Sciurus (Sciurus) carolinensis". In Wilson, D.E. ; Reeder, D.M (eds.). Mammal Species of the World: a taxonomic and geographic reference (3rd ed.). The Johns Hopkins University Press. pp. 754–818. ISBN 978-0-8018-8221-0. OCLC 26158608. ^ a b c d e Linzey, A.V. ; Koprowski, J. & NatureServe (2008). "Sciurus carolinensis". IUCN Red List of Threatened Species. Version 2008. International Union for Conservation of Nature. Retrieved 18 November 2008. ^ Huynh H.; Williams G.; McAlpine D.; Thorington R. (2010). "Establishment of the Eastern Gray Squirrel (Sciurus carolinensis) in Nova Scotia, Canada". Northeastern Naturalist. 17 (4): 673–677. doi:10.1656/045.017.0414. ^ McGoldrick, M.; Rochford, J. (2009). "Recent range expansion by the Grey Squirrel (Sciurus carolinensis Gmelin 1788". Irish Naturalists' Journal. 30: 24–28. JSTOR 20764520. ^ "Alien Species Alert" (PDF). Retrieved 8 March 2017. ^ "Summary (of Bertolino S., Lurz. P.W.W., Rushton S.P. 2006, DIVAPRA Entomology & Zoology)". Europeansquirrelinitiative.org. Archived from the original on 20 January 2011. Retrieved 10 June 2010. ^ a b Hamilton, H. (1990). Smith, D. (ed.). Eastern Grey Squirrel. Hinterland Who's Who. ISBN 978-0-660-13634-9. Archived from the original on 23 December 2014. Retrieved 18 November 2008. ^ "New York's Wildlife Resources" (PDF). Department of Natural Resources at Cornell University. p. 2. Archived from the original (PDF) on 15 July 2007. Retrieved 28 September 2013. ^ Nelson, Rob. "White and Albino Squirrel Research Initiative". UntamedScience.com. Retrieved 23 March 2015. ^ a b c d e f g h Koprowski, John (1994). "Sciurus carolensis". Mammalian Species. 480: 1–9. ^ a b c d "Red & Gray Squirrels in Massachusetts". MassWildlife. Massachusetts Division of Fisheries and Wildlife. Archived from the original on 17 May 2013. Retrieved 3 April 2012. ^ a b "Basic information about squirrels". ICSRS. Interactive Centre for Scientific Research about Squirrels. 17 November 2015. Retrieved 14 April 2017. ^ Murie, Olaus Johan and Elbroch, Mark (2005). 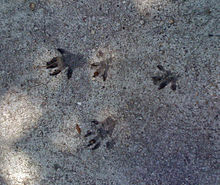 Peterson Field Guide to Animal Tracks, Houghton Mifflin Harcourt, p. 79, ISBN 061851743X. ^ McCracken, Brian. "DO SQUIRRELS REALLY KNOW WHERE THEY BURY THEIR FOOD?". Animals – mom.me. ^ Grant, Steve (21 October 2004). "The Squirrel's Bag Of Tricks: They Can't Get Out Of The Way Of Cars, But Other Behaviors Demonstrate Advanced Thinking (for A Rodent)", The Hartford Courant. 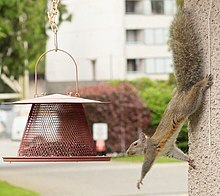 ^ "Smart squirrels fool food thieves", BBC Home, 17 January 2008. ^ Alexander, R. McNeill (2003). Principles of animal locomotion. Princeton University Press. p. 162. ISBN 978-0691086781. ^ Nations, Johnathan A.; Link, Olson. "Scansoriality in Mammals". Animal Diversity Web. ^ a b c d e f g Lawniczak, M. (2002). "Sciurus carolinensis". Animal Diversity Web. Retrieved 10 July 2008. ^ "The Grey Squirrel (Sciurus carolinensis)" (PDF). Grey squirrel Advisory. Archived from the original (PDF) on 7 February 2006. Retrieved 10 July 2008. ^ "Polyboroides typus (African harrier-hawk, Gymnogene)". Archived from the original on 3 November 2013. Retrieved 29 June 2013. ^ Curtis, Paul D. and Sullivan, Kristi L. (2001) Tree Squirrels, Wildlife Damage Management Fact Sheet Series, Cornell Cooperative Extension, Ithaca, N.Y.
^ a b c d e f Koprowski, John L. (2 December 1994). "Sciurus carolinensis" (PDF). Mammalian Species. 480 (480): 1. doi:10.2307/3504224. JSTOR 3504224. Archived from the original (PDF) on 27 March 2014. Retrieved 26 March 2014. ^ Webley, G. E.; Pope, G. S.; Johnson, E (1985). "Seasonal changes in the testes and accessory reproductive organs and seasonal and circadian changes in plasma testosterone concentrations in the male grey squirrel (Sciurus carolinensis)". General and Comparative Endocrinology. 59 (1): 15–23. PMID 4018551. ^ a b Kelly, John (9 April 2012). "Learn to speak squirrel in four easy lessons". Washington Post. Retrieved 7 March 2014. ^ Partan, Sarah R. (2010). "Multimodal alarm behavior in urban and rural gray squirrels studied by means of observation and a mechanical robot" (PDF). Current Zoology. 56 (3): 313–326. ^ a b Long, Kim (September 1995). Squirrels: a wildlife handbook. Big Earth Publishing. p. 95. ISBN 978-1-55566-152-6. ^ "How to Manage Pests – Tree Squirrels". University of California. Retrieved 23 May 2014. ^ Long, Kim (1995), Squirrels: A Wildlife Handbook, Johnson Books, pp. 144–146, ISBN 9781555661526. ^ Hanmer, Hugh J.; Thomas, Rebecca L.; Fellowes, Mark D. E. (2018). "Introduced Grey Squirrels subvert supplementary feeding of suburban wild birds". Landscape and Urban Planning. 177: 10–18. doi:10.1016/j.landurbplan.2018.04.004. ^ Hanmer, Hugh J.; Thomas, Rebecca L.; Fellowes, Mark D. E. (2017). "Provision of supplementary food for wild birds may increase the risk of local nest predation". Ibis. 159 (1): 158–167. doi:10.1111/ibi.12432. ^ "The Leading America Zoo Site on the Net". americazoo.com. Retrieved 30 October 2011. ^ "The Grey Squirrel – Sciurus carolinensis of Southern Africa". Home.intekom.com. Retrieved 10 June 2010. ^ "Sciurus carolinensis (Grey Squirrel)". Biodiversityexplorer.org. Retrieved 10 June 2010. ^ "Tree Squirrel | Rodent | Southern Africa". Krugerpark.co.za. Retrieved 10 June 2010. ^ a b "History of grey squirrels in UK". Daily Telegraph (UK). 28 August 2018. Retrieved 1 September 2018. ^ Emma Sheehy; Colin Lawton (March 2014). "Population crash in an invasive species following the recovery of a native predator: the case of the American grey squirrel and the European pine marten in Ireland". Biodiversity and Conservation. 23 (3): 753–774. doi:10.1007/s10531-014-0632-7. ^ "Jamie 'must back squirrel-eating'". BBC News. 23 March 2006. Retrieved 22 August 2007. ^ "Red squirrel conservation, squirrel ecology and grey squirrel management". The Friends of the Anglesey Red Squirrels. Retrieved 22 August 2007. ^ Wauters, L. A.; Gurnell, J.; Martinoli, A. & Tosi, G. (2002). "Interspecific competition between native Eurasian red squirrels and alien grey squirrels: does resource partitioning occur?". Behavioral Ecology and Sociobiology. 52 (4): 332–341. doi:10.1007/s00265-002-0516-9. ^ "Black squirrels set to dominate". BBC News. 20 January 2009. Retrieved 30 October 2011. ^ "The pack of mutant black squirrels that are giving Britain's grey population a taste of their own medicine". Daily Mail. London. 26 April 2008. ^ "Defra Rural Development Service Technical Advice Note 09" (PDF). Archived from the original (PDF) on 1 July 2007. ^ "Wild meat: Squirrel nutcase". The Economist, Vol. 402 Number 8772 (3 March 2012). ^ Blakeslee, Sandra (27 August 1997). "Kentucky Doctors Warn Against a Regional Dish: Squirrels' Brains". The New York Times. Retrieved 15 February 2017. Wikimedia Commons has media related to Sciurus carolinensis.